An exclusive line for producing superior quality Banana / Plantain / Cassava Chips. 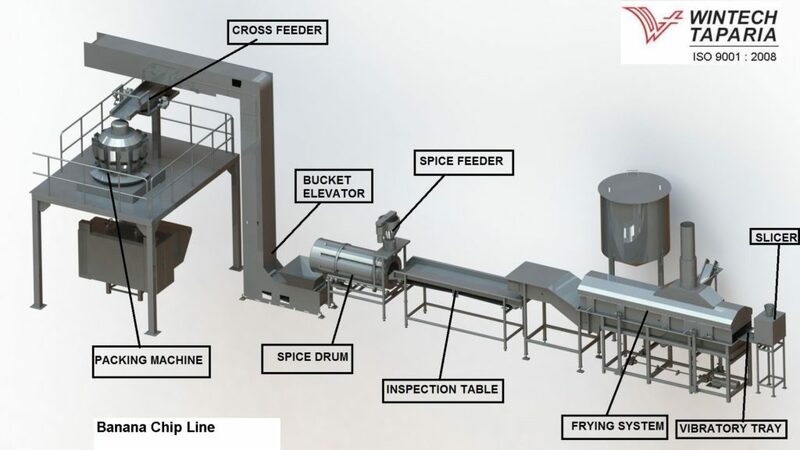 Continuous Frying System exclusively, designed for Banana Chips to achieve maximum product quality and operational flexibility. Hand Peeled Plaintain or Cassava can be directly sliced in to an oil flume at the infeed end of the fryer. Fried chips can go for on line flavoring and packing. Completely fabricated in stainless steel with components from reputed International suppliers. Proven performance, based on a customer driven know-how, to meet the quality and hygiene demands of the Snack Food Industry. Versatile Fryer to do many other floating type snack products. Suitable for cost effective and continuous production of Banana / Potato / Cassava / Tapioca Chips. It can also do many other floating type of snacks with high moisture in raw product. Capacity will depend on the product, thickness of slice, frying parameters etc..